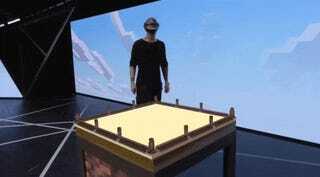 You can start a new world on any surface you’d like—as you can see in the GIF above. Magical. You can play Minecraft right on your wall, and then transfer it to another surface. You can manipulate the world using your voice and your hands. And of course, you can walk around and change your viewpoint whenever you’d like. You can zoom in, out, and around using your voice. You can raise the world and see things that are normally not visible. Whatever you look at? The game is aware of it. During the demo, the presenter looks at a TNT pack and tells the game to strike it with lightning. As amazing as the presentation is, it’s just a presentation. It’s worth remembering that the actual thing may not work as flawlessly when in the hands of actual consumers. Remember the Kinect? But for now, based on footage alone, this Minecraft thing certainly looks impressive.